Lloyd, the golden ninja, has summoned the powerful Golden Dragon into an epic stand-off against Lord Garmadon’s minions! Attach Lloyd onto the Golden Dragon and soar into battle! Avoid the launching catapult attacks with the huge extending wings! Fire the dragon sphere! Harness the power of the Golden Dragon to send Lord Garmadon’s soldiers back underground! Includes 3 minifigures with weapons: Golden Ninja Lloyd, scout and warrior…. 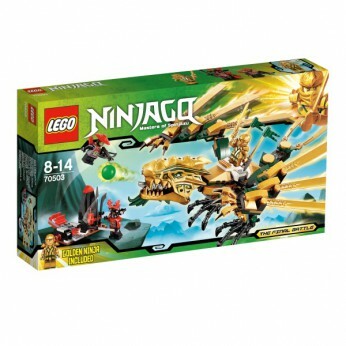 Lloyd, the golden ninja, has summoned the powerful Golden Dragon in this Ninjago set. Soar into battle, avoiding the launching catapult from Lord Garmadon’s minions! LEGO model number: 70503: Attach minifigure Lloyd onto the Golden Dragon and fly into battle. Avoid the launching catapult attacks with the Dragon’s huge extending wings. Harness the power of the Golden Dragon to send Lord Garmadon’s soldiers back underground. Includes 3 LEGO minifigures with weapons: Lloyd, a scout and a warrior. For ages 8 years and over; EAN: 5702014972902. WARNING(S): Not suitable for children under 3 years old. Lloyd, the golden ninja, has summoned the powerful Golden Dragon into an epic standoff against Lord Garmadon’s minions. Attach Lloyd onto the Golden Dragon and soar into battle. Avoid the launching catapult attacks with the huge extending wings. Fire the dragon sphere. Harness the power of the Golden Dragon to send Lord Garmadon’s soldiers back underground. This LEGO set Includes 3 minifigures with weapons: Golden Ninja Lloyd, scout and warrior. This toy costs approximately £21.49 (for the latest and best prices make sure you check our retailer list for the LEGO Ninjago The Golden Dragon 70503 above). In our review of LEGO Ninjago The Golden Dragon 70503 we classed it as being suitable for ages 6 years, 7 years, 8 years, 9 years, over 10 years but recommend you check the manufacturer specific advice before purchasing.